Dr. Lamberton and his team members are there to answer your questions and guide you through your dental care visit. You will always have the opportunity to tell us how you are feeling and if there is anything else we can do to maximize your comfort. Comfort and convenience are the hallmarks of our office. To ensure your convenience, below is the information you need about our hours, appointment scheduling, insurance acceptance and billing. If you want to ask Dr. Lamberton a question or want to receive more information please visit our contact page and submit a question. We very much appreciate and value you as a patient in our practice. So that we may continue to have an excellent, mutually beneficial relationship, we would like to take this opportunity to express our office expectations. Greet you in a friendly, professionally matter. Seat you as soon after your arrival as possible. Outline the cost associated with any treatment before the beginning. Provide the most advanced dental procedures and materials. Maintain a clean and professional office. Sterilize all instruments and disinfect all treatment rooms. Do everything possible to make you feel welcome and comfortable. Assist you in processing your insurance claims. Remind you of your scheduled appointments a day in advance. Treat any friend and family you refer to us with the same personal attention. Give us at least 48 hour notice for any appointment changes to avoid a cancellation fee. Pay for your services before or at the time of treatment. Keep us updated regarding changes in your personal information, such as mailing address, telephone numbers, and email addresses. Notify us of changes of your general health status, including any special needs you may have. Brush and floss daily as recommended by our team. See us regularly for appointments. Feel comfortable referring your friends and family members to our office. Our goal is to help you achieve and maintain optimal dental health. For our patients that do have dental insurance, as a courtesy, we will assist you by processing your insurance claims. Although, it depends on your specific plan we find that most of our patients insurance plans pay for a percentage of the services we provide. Some services that you may want or need may not be covered by your particular insurance plan. Their goal is to provide only negotiated benefits for services specifically selected by your employer. As your dentist, we have no control over how much or even if dental insurance will reimburse you for your dental care. Dr. Cecil Lamberton requires payment in full at the time of service. We accept MasterCard, Visa, American Express, Discover, cash, and personal checks. 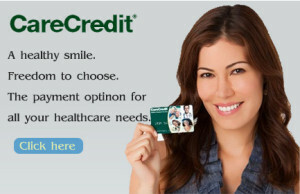 At Dr. Lamberton’s office we offer CareCredit. CareCredit is here to help you pay for treatments and procedures your insurance doesn’t cover. We offer No Interest* financing or low minimum monthly payment options so you can get what you want, when you want it. You can even use CareCredit for your family and favorite pet. For over 20 years, we’ve been helping over five million cardholders get the healthcare treatments they want and need.